Tucson youth hockey parents and players are excited about professional hockey returning to the Old Pueblo. In April, the Arizona Coyotes purchased the American Hockey League’s (AHL) Springfield (Mass.) Falcons with the intent of moving their top affiliate to Tucson. As the move cleared hurdle after hurdle, Ryan DeJoe, coaching director for the Tucson Youth Hockey Association said his players and coaches started to get pumped up. Professional hockey hasn’t been in Arizona’s second biggest city since the Scorch shut down less than 24 hours before its first game in 2000. In the meantime, the Tucson Tilt played junior hockey in the Western States Hockey League in 2006-07, while the University of Arizona Icecats (now Wildcats) carried the torch for the sport in Tucson. Tucson, the largest metropolitan area in the U.S. without an ice rink, saw its latest ice rink close in 2007. Since then, UA, adult and youth hockey have shared the Tucson Arena, the AHL team’s projected home. The new pro team’s arrival has raised concerns that the other Tucson hockey players will be squeezed out — UA sometimes practices in Chandler and some Tucson kids play for Valley of the Sun teams, but DeJoe said he isn’t concerned. DeJoe said the ice at the arena goes mainly unused during the day, a time when the pros could practice while the adults, UA and youths could continue to use the ice at night. Previous hockey teams have failed in Tucson, like the Mavericks of the Central Hockey League and Icemen of the Southwest Hockey League in the 1970s, the Gila Monsters from the West Coast Hockey League in the 1990s and the Western Professional Hockey League’s Scorch in 2000. However, San Diego also had trouble sustaining hockey teams, but averaged over 8,000 fans in its first AHL season this year in an older arena in a Sun Belt city. In 2008, the Arizona Diamondbacks’ Triple-A Tucson Sidewinders affiliate moved to Reno, Nevada, and another AAA baseball team, the Tucson Padres, moved to El Paso in 2013. Those teams played in an unpopular ballpark, though the Tucson Arena is downtown at the Tucson Convention Center. 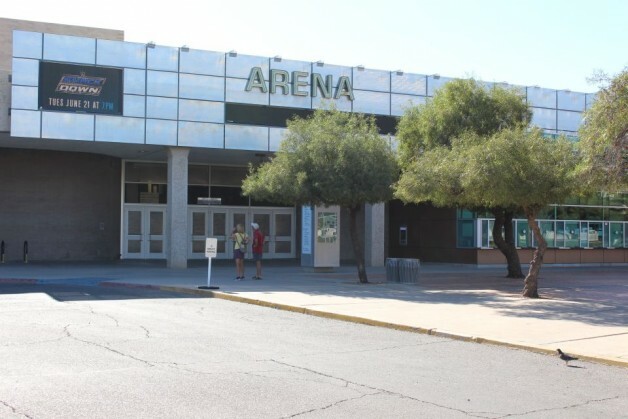 The Tucson Arena opened in 1971, but has underwent renovations, most recently an $8 million face lift last year that saw the rest of the seats get replaced, new concession stands, restrooms and lighting and new sound video boards and scoreboards. The burned-out light bulbs on the north side of the arena in the penalty time section of the scoreboard are a thing of the past. DeJoe thinks an AHL franchise can succeed in Tucson.